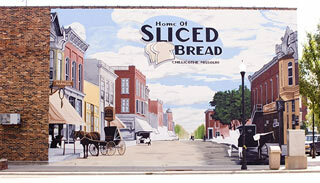 Home of Sliced Bread Mural in Chillicothe, Missouri! 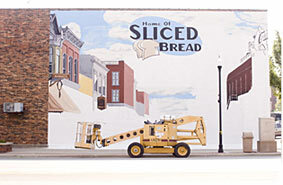 A mural showcasing Chillicothe's historical mural program and its sliced bread history is taking shape on the web side of the building housing The Clipper on Washington Street, north of the Livingston County Courthouse. Local artist Kelly Poling advises the mural will measure 27 by 45 feet when completed and will depict Locust Street as it looked around the turn of the century. "This mural is going to be really cool," Poling said, adding that the mural's two vanishing points and the sliced bread logo will catch the eye of almost anyone traveling either direction along Washington Street. Specifically, Poling said, the mural will show Chillicothe as someone would have viewed it around 1900 standing in the middle of Locust Street, looking south from a location between Calhoun and Webster Streets. He noted that there will be store fronts on either side and a horse by a post on the mural's right side. The left side of the mural will feature a horse-drawn wagon and the sliced bread logo will be in the middle. "In this mural will be lots of grays and brick reds and some yellows," Poling said. 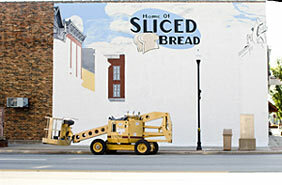 The Chillicothe Rotary Foundation, the Chillicothe Development Corporation, and the building's owner, Jerry BeVelle of Springfield, Missouri, all contributed funds for the mural as did the Home of Sliced Bread Committee. 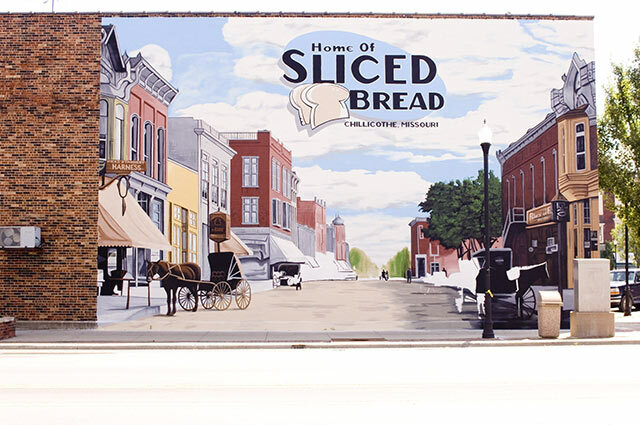 Amy Supple of the Greater Chillicothe Visitor's Region advised that the mural will showcase "our wonderful historical mural program and our sliced bread history and heritage which are two of our biggest attractions." 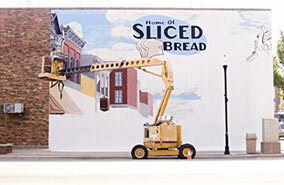 The sliced bread mural will make the 13th historical mural completed in downtown Chillicothe. Main Street Chillicothe is the overseeing organization of the Chillicothe mural project and takes care of the upkeep and maintenance of the murals. All the murals may be viewed by visiting the Main Street web site.